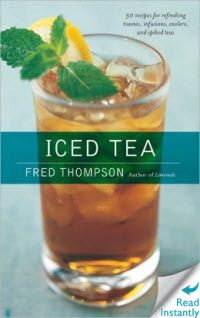 Fred Thompson has written books about a variety of beverages, including lemonade, hot chocolate, and bourbon. But with iced tea season getting under way for so many of us it’s as good a time as any to mention the other beverage he wrote about. Yes, that would be iced tea. Iced Tea: 50 Recipes for Refreshing Tisanes, Infusions, Coolers, and Spiked Teas is not exactly a new release. But it’s kind of an old standby and it’s worth looking at again, given that it’s the time of the year for this sort of thing. Which seems to be the follow up and/or companion volume to the author’s The Vintage Tea Party Book: A Complete Guide to Hosting your Perfect Party, which came out a year earlier. If that’s not enough of this sort of thing for you, then take a look at Vintage Tea Party, by Carolyn Caldicott, which was published the same year.